US President Barack Obama has called off joint US-Egypt military drills scheduled to take place next month in protest of the Egyptian government’s brutal crackdown on protesters, in which more than 630 people were killed on Wednesday. While Obama said that the US had national security interests in the region and "sustained commitment to Egypt", he stressed that it could not be business as usual after the crackdown on protesters. “Violence will only feed the cycle of polarization,” the US leader said, adding that Washington opposes "the pursuit of martial law" in Egypt and calling to lift the state of emergency. "As a result, this morning we notified the Egyptian government that we are canceling our biannual joint military exercise, which was scheduled for next month," Obama then said. The Bright Star military exercise has been a cornerstone of relations between the Pentagon and the Egyptian military, since it was inaugurated after the Camp David peace accords signed by the US, Egypt and Israel in 1978. 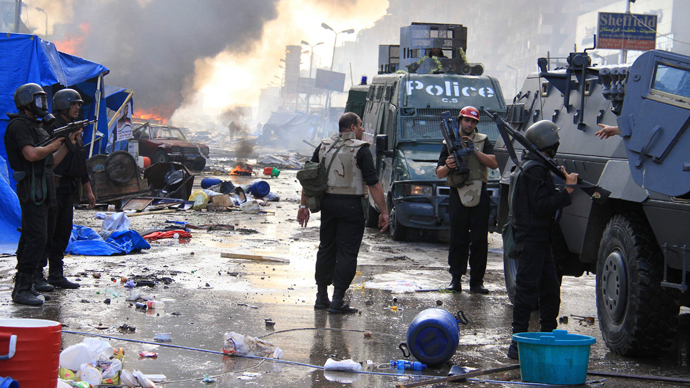 The 2011 exercises were canceled shortly after the ousting of President Hosni Mubarak in January that year. Obama said that the US could not dictate Egypt’s next steps, but it remains unclear whether the cancellation of the Bright Star exercises would nudge Egypt towards a more peaceful resolution of the political crisis and halt the suppression of pro-Morsi demonstrators. The US leader also slammed the violence instigated by the MB. “We call on those who are protesting to do so peacefully and condemn the attacks that we’ve seen by protesters, including on churches,” he said. US Defense Secretary Chuck Hagel called Egyptian army chief General Abdel Fattah al-Sisi on Thursday to say that the US remains ready to work with all parties to ensure a peaceful way forward is achieved in Egypt, stating that the US would maintain military ties with the country. However, he said that defense ties were in rocky waters. "I made it clear that the violence and inadequate steps towards reconciliation are putting important elements of our longstanding defense cooperation at risk," Hagel said in a statement to Reuters. The US provides some $1.5 billion in annual assistance to Egypt, $1.3 billion of which goes to the military, and about $250 million goes in economic aid. Some observers say this aid could be used to put pressure on the current Egyptian leadership to moderate its authoritarian rule. In July, a bill put forward by Republican leaders of the House Appropriations Sub-Committee proposed canceling the annual $250 million in economic aid for Egypt. The money was not included in the foreign aid budget for 2014, but the aid was not publicly canceled. 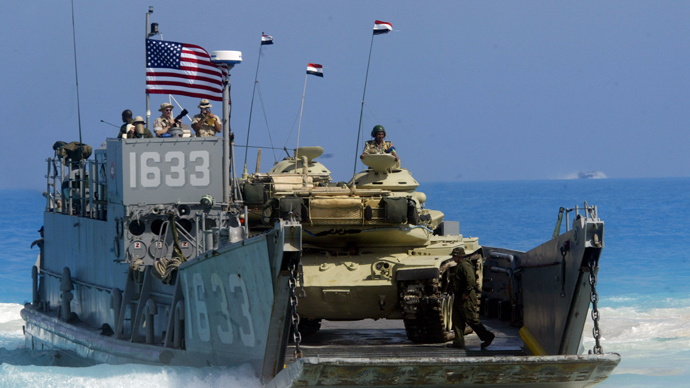 Senator Rand Paul said cancelling the joint military exercise with Egypt is not enough, as federal law requires suspending military aid when there has been a military coup. 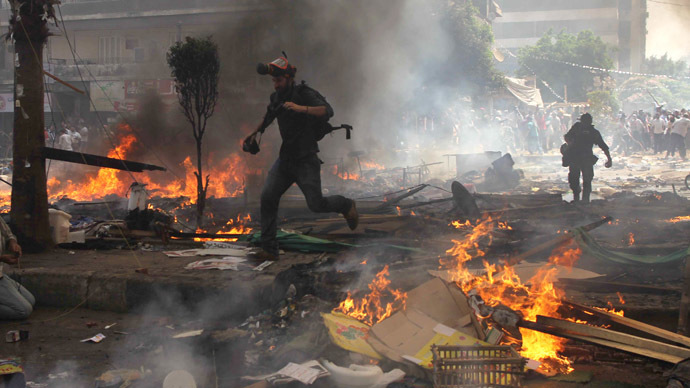 At least 638 people were killed and 3,994 injured, as violence swept through Egypt on Wednesday, according to a tally on Thursday by the Egyptian Health Ministry. The bloodshed was sparked when Egyptian security forces brutally broke up the sit-in camps of Muslim Brotherhood supporters in Cairo. 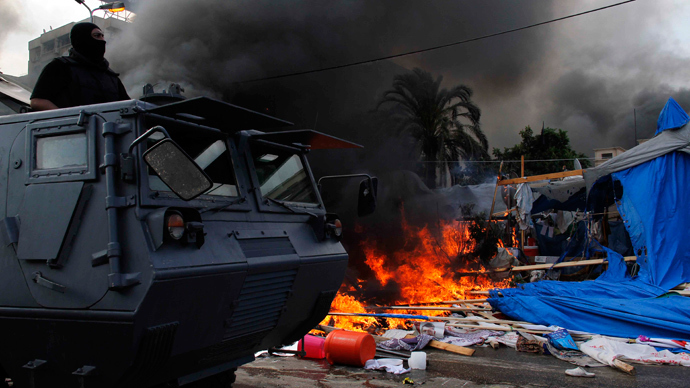 A state of emergency was declared in major cities including Cairo, Alexandria and Suez, on the day of the deadly upheaval, and a curfew imposed. Despite warnings from Egyptian authorities, demonstrators have continued to express anger at the government, specifically in the wake of Wednesday’s violence. 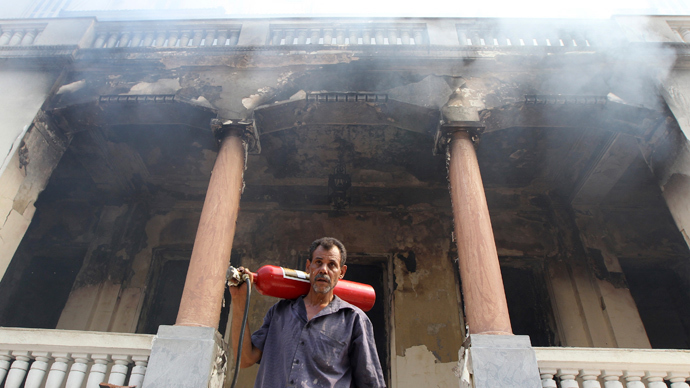 On Thursday, hundreds of Muslim Brotherhood loyalists marched on Alexandria, while others set fire to a government building in Giza.